The Tomlinson Hot & Cold Water Faucet is made to work with an instant hot water dispenser, but can also be used with reverse osmosis systems. NOTE: The Tomlinson Designer Hot and Cold Dispenser Faucet is not compatible with Insinkerator products. 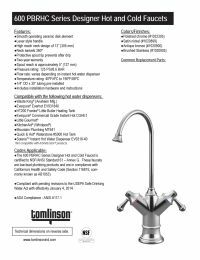 The Tomlinson Designer Hot and Cold Dispenser Faucet is compatible with reverse osmosis systems when used with a separate air gap like the twin inlet air gap.